Not to be confused with Clifford Alexander Jr..
Cliff Alexander (born November 16, 1995) is an American professional basketball player for Brose Bamberg of the Basketball Bundesliga (BBL). He completed his freshman season at the University of Kansas for the Jayhawks' on their 2014–15 team. He declared himself eligible for the 2015 NBA draft but was undrafted. He played in high school at Curie High School in Chicago where he won Naismith and Mr. Basketball USA recognition as national player of the year. He did not play organized basketball until eighth grade, but by late in his freshman season he became a notable contributor to his high school's varsity team. He was ranked among the top 20 prospects in the national class of 2014 prior to his sophomore season. As a junior, he moved into the top 10 of the national class and was recognized as an All-American. By the beginning of his senior season, he was considered to be a top 5 player by most talent evaluators and his stock was still on the rise. Following a Martin Luther King Day performance during his senior year against the number one team in the country, many experts considered him to be the best player in the national class of 2014. In 2013, he represented USA Basketball in international play. Several talent scouts praised his powerful game. As a high schooler, Alexander felt he was most often compared to Amar'e Stoudemire. He was also contrasted with crosstown rival Jahlil Okafor, especially as a senior when they vied for national attention. Alexander was heavily recruited by many top Division I basketball programs and his recruitment was widely followed. He played in the 2014 McDonald's All-American Boys Game, 2014 Jordan Brand Classic and the 2014 Nike Hoop Summit, earning co-MVP of the Jordan Brand Classic. Alexander led Curie to the 2014 Chicago Public High School League city championship in a quadruple-overtime game against Okafor that was the lead story on SportsCenter. The championship was later forfeited. As a freshman with Kansas, he did not play in the latter part of the season after the National Collegiate Athletic Association (NCAA) launched an investigation into his eligibility. Alexander, who was also a highly regarded football player, did not play organized basketball until eighth grade. Alexander played on Curie's 2010–11 varsity team as a freshman, but had little impact at first and sat out some games in December. He missed the first ten games due to a heart murmur. In late December, he started getting local attention as part of the reason Curie remained undefeated. During the Chicago Public High School League (CPL) and Illinois High School Association (IHSA) playoffs, he contributed significant performances. On March 9, 2011, Curie was eliminated from the IHSA playoffs in a Class 4A sectional semifinal by Lyons Township High School as freshman Alexander posted 9 points, 13 rebounds, and 2 blocks in a 66–64 loss. His late-season contributions gave Curie an added dimension, as the team finished with a 28–3 record. Following his freshman season, Alexander began to be recognized by local evaluators as a potential top national recruit. After Jabari Parker and Jahlil Okafor, Alexander was already considered the best Chicago area basketball prospect. He earned Red-Central all-conference recognition. As late as August 2011, Alexander remained unrecognized by most national evaluators. However, as Alexander entered his sophomore season, he was one of three area prospects that were firmly among the national class of 2014's top 25 prospects (along with Whitney M. Young Magnet High School teammates Okafor and Paul White). As of September 1, 2011 Alexander was ranked 13 by ESPN.com and 9 by Rivals.com. On December 30 in the Pontiac Holiday Tournament, Parker's Simeon Career Academy defeated Alexander's Curie 44–27 as Alexander was almost shut out by Simeon's Steve Taylor. On January 22, 2013, Okafor and Alexander went head to head in CPL play. Curie defeated Young by a 57–46 margin as Alexander had 10 points, six rebounds and three blocks before having a personal foul disqualification. Despite fouling out, Alexander had the better game with nearly a dozen Division I programs in attendance. Curie had a rematch against Simeon in the February 17 CPL championship game with Alexander again being ineffective on offense with four points against Parker and Taylor as Curie lost 53–49. The game broadcast on ESPN3. Following the season, a statewide panel of sportswriters and broadcaster voted Alexander as an Associated Press boys basketball Class 4A all-state honorable mention honoree. At the June 2012 Pangos All-American Camp, Alexander was selected as the Most Outstanding Player. Alexander, who was already a top 5 recruit according to some sources, endured a Summer 2012 foot injury that sidelined him. By mid-July 2012, as ESPN's number 10 ranked prospect, he received an offer from Kentucky and was being recruited by DePaul, Indiana, Ohio State and Wisconsin. Upon receiving his offer from Kentucky, he told Rivals.com that his two leading schools were Kentucky and Michigan State. By the fall of his junior season, the Illinois class of 2014 was being mentioned as one of the all-time great statewide classes of basketball players. Chicago Sun-Times writer Joe Henricksen noted that there was a high chance that this would be the fifth Illinois class and first since 2002 to include three McDonald's All-Americans. He also noted that the class has a chance to rival if not surpass the classes of 1998 and 2011 which each had nine top 100 players. On November 30, at a Draffenville, Kentucky tournament game against Oak Hill Academy, Alexander scored 26 of his teams 39 points on 12–14 field goal shooting in a 72–39 defeat. On December 29, Curie again faced Parker and Simeon in the Pontiac Holiday Tournament (this time in the semifinals). Alexander posted 21 points on 9–10 field goal shooting, but Simeon still prevailed 62–57. 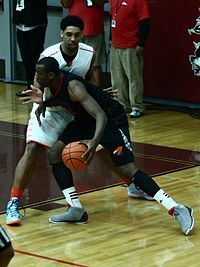 Notably, Parker assumed Alexander as a defensive assignment after Alexander gave Curie a 48–47 lead with 4:58 time remaining and Alexander went scoreless the rest of the game. Despite 11 points, 9 rebounds and 8 blocked shots from Alexander, Curie was eliminated from the CPL playoffs in a February 11 quarterfinals 60–58 loss to the Billy Garrett, Jr.-led Morgan Park High School that went on to become 2013 IHSA Class 3A state champion. On February 26, the Associated Press Illinois Class 4A basketball rankings showed Whitney Young at number 1, and it was also expected that Young's road to the sectional finals would include a March 6 meeting with Curie. According to Henricksen, the March 6 state playoff meeting between Young and Curie was anticipated because it would pit Okafor against Alexander, making it the most highly touted IHSA playoff matchup of centers since 1988 when LaPhonso Ellis led East Saint Louis' Lincoln High School against Eric Anderson's St. Francis de Sales High School. Mike Helfgot of the Chicago Tribune said that there have not been many matchups between big men this good with so much at stake. On March 2, Alexander attended Senior night at University of Illinois at Urbana–Champaign's Assembly Hall. The February 2013 Great Plains blizzard caused controversial postponements of several IHSA games including the March 6 Young-Curie game, which was delayed one day. Young defeated Curie 62–58 as the supporting cast made up for Alexander's 14–13 scoring edge over Okafor. In late April 2013, Okafor's father believed it was very possible that Okafor and Tyus Jones would matriculate together as a package. By late April 2013, there were rumors that Alexander and Justise Winslow would attend whatever school Jones and Okafor attended. Although Alexander was ranked as the fifth best player in the class of 2014 by Rivals.com and had offers from four of the six schools common to Jones and Okafor by the beginning of June, he said the chances of him matriculating with Jones and Okafor was slim. Alexander was recognized as a 2013 All-CPL first team selection by the Chicago Sun-Times along with Parker, Okafor, Kendrick Nunn and Garrett. Alexander was recognized as an Associated Press All-State Class 4A first team selection along with Parker, Okafor, Malcolm Hill and Sterling Brown. The Chicago Tribune named him to its All-State first team along with Parker, Okafor, Jalen Brunson and Tyler Ulis. Alexander was one of five underclassmen selected by HighSchoolHardwood.com as an All-American, along with Okafor, Jones and Stanley Johnson (all first team) and Joel Berry (second team along with Alexander). Alexander has become a member of the Mac Irvin Fire AAU team along with Okafor. During the Nike-backed Pro-Am summer basketball Chi-League Alexander, Okafor and Parker were on the same team. He showed potential that LeBron James himself noticed at the July LeBron James Skills Academy. He also stood out at the July Under Armour Summa Jam, where his Mac Irvin Fire opposed teams led by Myles Turner and Karl-Anthony Towns. On September 4, 2013, Rivals.com updated their ranking with Alexander maintaining his number 4 ranking. At the time, Eric Bossi of Rivals described Alexander as " perhaps the most powerful player in the high school ranks". In September, Alexander believed that he would make his final selection with a December verbal commitment and an April signing of his National Letter of Intent. On October 7, the Hoophall Classic schedule was announced and Curie was scheduled to play Montverde Academy on January 20. By some accounts Kansas was a favorite because his girlfriend was a student at Kansas and the 2013–14 Kansas Jayhawks were scheduled to play the 2013–14 Duke Blue Devils at Chicago's United Center in the ESPN Champions Classic on November 12 just before his scheduled announcement. In 2013 Caelynn Manning-Allen became a freshman on the Kansas women's basketball team. However, Illinois was very excited to be in serious contention for Alexander. It was the first time since Derrick Rose in 2006 that a top 5 prospect was still considering Illinois so late into his senior year and Alexander's level of interest seemed much higher than Rose's. Following his Illinois visit, his scheduled announcement date had moved forward to November 15. On October 31, Alexander officially eliminated Michigan State from his candidate list, leaving Kansas, Illinois, DePaul and Memphis in contention. On November 7 Alexander was ranked second behind points leader Emmanuel Mudiay in the Mr. Basketball USA preseason tracker. Although he had only one first place vote on the ten ballots, he was ranked ahead of Okafor and Stanley Johnson who combined for seven first place votes. Alexander and Mudiay were the only players named on 9 of the 10 ballots. The preseason points leader has gone on to win the award in four of the prior five years. His November 15 verbal commitment announcement was scheduled on the same date as Okafor, Jones and Stanley Johnson. According to ESPN, all four were among the top 10 in the national class (Okafor #1, Alexander #3, Jones #4 and Johnson #9). On the eve of his announcement, Kansas and Illinois were the favorites for his services. He made his verbal commitment on ESPNU to Kansas basketball on November 15. He was flanked by his father (Clifton Terry) and mother (Latillia Alexander). Prior to his senior season, USA Today named him to its 10-man preseason All-USA team along with Stanley Johnson, Jones, Trey Lyles, Emmanuel Mudiay, Malik Newman, Okafor, Oubre, D'Angelo Russell, and Turner. Alexander was joined on the Chicago Tribune's preseason Illinois Mr. Basketball top 5 by Okafor, Brunson, Ulis and Keita Bates-Diop. Alexander posted 22 points, 20 rebounds, and 5 blocks in a December 7, 66–62 victory at UIC Pavilion against USA Today's Super 25 number 11 ranked Bishop Gorman High School and its highly touted Stephen Zimmerman. Alexander almost had to serve a one-game suspension from the game due to having been assessed two technical fouls on December 1 against St. Rita High School. Alexander had an impressive start to his season. On December 12, he posted a triple double against Dunbar High School with 30 points, 24 rebounds, and 15 blocked shots. That week (December 9–17), he earned the Midwest player of the week from StudentSports.com. As a senior, he finally led Curie past three-time defending tournament champion and four-time defending Class 4A state champion Simeon to win the Pontiac Holiday Tournament with 16 points, 16 rebounds, and 6 blocks, earning tournament MVP honors. Even as a top 5 selection, Alexander's stock continued to rise as a senior, according to the Chicago Sun-Times' Joe Henricksen. Some of the stats that Alexander posted were so impressive as to cause disbelief to some, including Chicago Tribune high school basketball writer Mike Helfgot and several of his associates. In early January, Alexander continued to be a leading contender for national player of the year, holding on to second place in the Mr. Basketball USA race. On January 10, Alexander led Curie past Villa Angela-St. Joseph High School, which featured Rivals.com Class of 2015 number 10 ranked Carlton Bragg. In the January 20 Hoophall Classic, Alexander led Curie to a victory over D'Angelo Russell, Ben Simmons and Montverde Academy, the number one rated team in the country. Curie trailed by 9 points entering the fourth quarter, but Alexander had 13 of his 30 points in the final 4 minutes and 30 seconds to key the comeback. Alexander also had 12 rebounds and 5 blocks. Following the game, several writers, including CBS Sports college basketball writer Jeff Borzello said that Alexander has a valid case to present in terms of being the best high school basketball player in the country (along with Okafor, Turner and Mudiay). High school basketball writer Ronnie Flores regards the performance as one of the top 5 performances against a nationally highly rated high school basketball team since the turn of the century, ranking it with Louis Williams (2005), Kevin Durant (2006), Kevin Love (2007) and LeBron James (2001). The win bolted Curie to the number one ranking in the nation according to StudentSports.com. Alexander's performance moved him to the top of the rankings in the Mr. Basketball USA midseason tracker. He was ranked first by a wide margin and held the number one position on 7 out of 10 ballots. As the CPL playoffs began on February 5, a February 21 championship game clash between Okafor and Alexander was pondered in the local press after the 32-team brackets were announced. The CPL playoffs began with victories over Perspectives Charter by 71–37 and North Lawndale Charter High School 75–63. Against North Lawndale, Alexander had 27 points, 15 rebounds and 5 blocks. On February 16, Curie defeated Simeon 71–64. Alexander had 16 points, 12 rebounds, and 6 blocks earning a February 19 CPL semifinals rematch against Hyde Park Academy High School who they have already beaten twice this season. Alexander and Curie won 58–56 to reach the anticipated city championship matchup with Young and Okafor at the Jones Convocation Center. Alexander had a triple double with 10 points, 10 rebounds and 10 blocks. The matchup was the most anticipated city championship game since at least 1998 when fellow McDonald's All-Americans Quentin Richardson of Young and Corey Maggette of Fenwick High School were both top 15 players. On February 20, Alexander improved his first place total in the Mr. Basketball USA Tracker, holding eight first place and two second place votes. Curie won the city championship 69–66 in quadruple overtime as Alexander had 20 points, 14 rebounds and 4 blocks according to Chicago Tribune and Comcast SportsNet, while the Chicago Sun-Times and Sports Illustrated credited him with just 12 rebounds. This came against Okafor who had 16 points and 9, 8 or 4 rebounds before fouling out with 2:13 remaining in regulation depending on which of the three sources you believe. The CPL Championship game was attended by Mayor of Chicago Rahm Emanuel and was the lead story on the late edition of SportsCenter. Seven days later, Curie was forced to forfeit all of its wins and the CPL championship due to the academic ineligibility of seven of its players. The title will remain vacant. Okafor and Alexander vied for a host of local and national player of the year awards, with each winning multiple national player of the year awards. Young and Curie were both in the Marist Class 4A sectional in the 2014 IHSA playoffs and could have met again in the round of sixteen on March 14 if they had both won three regional contests. Despite forfeiting all wins in CPL games, Curie remained eligible to compete in the IHSA playoffs due to differences in eligibility rules. On March 4, Curie lost their opening IHSA playoff game to 11–11 DuSable High School by an 88–85 margin in overtime. It marked Curies first loss of the season on the court with Alexander in the lineup. Alexander posted 25 points, 15 rebounds, and 8 blocks despite fouling out in the final minute of regulation time. Curie trailed 13–2 early and led 47–32 midway through the third quarter. Curie starters Josh and Joseph Stamps were ineligible for IHSA play as was Malik Washington. In the April 2, 2014, McDonald's All-American Game Alexander posted 9 points and a game-high (tied with Kevon Looney) 11 rebounds for the losing east team. In the April 18 Jordan Brand Classic, he was co-MVP (with Okafor). In the game, he posted 23 points, 8 rebounds and 5 blocks. Alexander was selected to the 10-man Team USA for the 17th annual Nike Hoop Summit on April 12, 2014 at the Moda Center. He was selected along with fellow Chicagoan Okafor and fellow Kansas commit Oubre. He was also selected to the 24-player 37th annual April 2, 2014 McDonald's All-American Boys Game at the United Center. He was joined as a McDonald's All-American by fellow Chicagoans Ulis and Okafor as well as Oubre. He was recognized as first team All-City along with Young teammates White and Okafor as well as Louis Adams, Jr. of Orr High School, and Luwane Pipkins of Bogan High School by the Chicago Sun-Times. On February 18, he became one of three finalists for the Naismith Prep Player of the Year Award along with Okafor and Stanley Johnson. On March 7 Alexander won the Chicago Sun-Times Player of the Year as well as the Naismith Player of the Year. On March 10, he was one of 26 players selected for the April 18, 2014 Jordan Brand Classic again along with fellow Chicagoans Ulis and Okafor as well as fellow Kansas commit Oubre. He was recognized as one of twenty Parade All-Americans. He was named Associated Press Class 4A 1st team All-state with Okafor, Brunson, Ulis and Sean O'Mara. Alexander lost out to Okafor in the Illinois Mr. Basketball voting by a 492–402 vote. He was a USA Today first team All-USA Boys Basketball Team selection along with Okafor, Oubre, Mudiay, and Stanley Johnson. He earned first team All-American recognition from MaxPreps on April 13. On April 16, he earned another national player of the year award Mr. Basketball USA. "Kansas 2014 Basketball Commitments". Rivals.com. Retrieved May 1, 2014. "2014 Kansas Basketball Commits". Scout.com. Retrieved May 1, 2014. "ESPN". ESPN.com. Retrieved May 1, 2014. "Scout.com Team Recruiting Rankings". Scout.com. Retrieved May 1, 2014. "2014 Team Ranking". Rivals.com. Retrieved May 1, 2014. In high school, Alexander (left) was contrasted with crosstown rival Jahlil Okafor (right). Prior to his sophomore season, he was considered more raw, but more athletic than Okafor, according to the Chicago Sun-Times basketball reporter Joe Henricksen. At that stage in head-to-head competition, Alexander was overmatched by Okafor. Following his sophomore season, Reggie Rose (Derrick Rose's brother) noted that Alexander was more suited toward a fast break offense while Okafor would be more likely to excel in a half-court set. He is also compared to Anthony Bennett, although Alexander needs to improve his outside shooting to make the comparison valid and he needs to improve his low post mastery for a valid comparison to Jared Sullinger. Alexander feels he is most often compared to Amar'e Stoudemire, which he is comfortable with because he views Stoudemire as someone who "...can shoot the 15-footer, put it on the floor, post moves, sets good screens." NBADraft.net compares Alexander to Thomas Robinson, while Bleacher Report's Kerry Miller compared him to Robinson and Julius Randle, noting despite his phenomenal physicality, he is undersized to play center and lacking the midrange jump shot necessary to play power forward. He is known as the type of player likely to get a slam dunk if he gets the ball near the rim. His high dunk frequency is attributed to his multidimensional quickness, intuitive sense for the ball and his "brute physicality". His "sheer dominance, along with his physical and athletic presence" are what make him a unique talent. At the July 2013 LeBron James Skills Academy, James told him to develop his ballhandling and strength. Alexander is also compared to local products Jabari Parker and Jahlil Okafor for off the court reasons. Whereas, they have been groomed to think about behaving like future celebrity athletes, Alexander is a star from off the street who has to be reminded of his role now. For example, when WGN named him athlete of the month in December 2013, they quoted his coach Mike Oliver who said, "People fail to realize (Simeon and Duke star) Jabari Parker and (Duke-bound Young center) Jahlil Okafor were groomed for this. For Cliff, this came out of nowhere, like a big wind thrown in his face." As a senior, he and crosstown fellow Naismith Prep Player of the Year Award finalist Okafor were compared by a Chicago Sun-Times photographer as follows: "Okafor is Beverly Hills, Cliff is Inglewood." because Okafor is known for his polished footwork and finesse, Alexander is known for his dominating power game of dunks and blocks. Sun-Times reporter Michael O'Brien stated the comparison more eloquently saying that for the next generation area big men will be compared to the duo: "Alexander as the gold standard for speed, power and athleticism; Okafor for technique, poise and polish." Alexander entered his college career as the Big 12 Conference Preseason Co-Freshmen of the Year (along with Myles Turner) according to a vote of the league's head coaches. In its preseason top 100 player ranking, Alexander was listed at number 27 by ESPN. USA Today named him to its Preseason All-American third team and NBCSports.com named him as an honorable mention for its Preseason All-American team. He was also listed as a John R. Wooden Award Preseason Top 50 candidate and a Wayman Tisdale Award Watch list selection. Alexander was also included in the early December Naismith Award top 50 watch list. Alexander began the season coming off the bench. On November 24, Alexander had his first double-digit output with 10 points against Rider. In the 2014 Orlando Classic semifinals against Tennessee on November 28, he posted 16 points. Then in the finals against #20 Michigan State on November 30, he contributed 4 blocks. On December 5 during the Big 12/SEC Challenge contest against Florida, Alexander posted a team-high 10 rebounds along with 12 points for his first collegiate double-double. On December 20, Alexander was expected to be in the starting lineup for the first time against Lafayette, but he was not. However, he started on December 22 against Temple. On January 19 against #19 Oklahoma, Alexander posted 13 points and 13 rebounds. The 13 rebounds in just 23 minutes played marked a career high for Alexander and an individual season high for the Jayhawks. Alexander was named Big 12 newcomer of the week on January 26, 2015. Alexander made his second start of the season on February 10 against Texas Tech, replacing Jamari Traylor in the lineup and posting 10 points, 4 blocks and 5 rebounds. On February 28, Alexander was inactivated due to an undisclosed NCAA investigation as a precautionary measure. He did not play any games after February 23 because of the investigation of his mother's initiation of pre-NBA draft loan processing. On April 7, in the face of a battle for NCAA reinstatement that saw him miss the last 8 games of the season, Alexander declared for the June 25, 2015 NBA draft. On May 31, Alexander suffered a right knee injury in draft workout with the Los Angeles Lakers. After going undrafted, Alexander joined the Brooklyn Nets for the 2015 NBA Summer League. He averaged 6.7 rebounds, 0.3 assists, and 1.5 blocks in 22 minutes per game in the Summer League. On July 24, 2015, Alexander signed with the Portland Trail Blazers. By the beginning of training camp, Alexander's injury caused him to be expected to miss two weeks. He was one of five non-guaranteed contract players vying for three roster spots. Alexander missed the entire preseason with the Trail Blazers due to his knee but made the roster and entered the season behind Meyers Leonard, Mason Plumlee, Ed Davis, Noah Vonleh, and Al-Farouq Aminu on the depth chart. Despite minor torn cartilage issues, Alexander was active for the first time on November 8 in Portland's seventh game of the season. Alexander played 17 minutes on November 15, posting 4 points, 4 rebounds and a block against Charlotte. On March 10, 2016, using the flexible assignment rule, Alexander was assigned to the Santa Cruz Warriors, the D-League affiliate of the Golden State Warriors. On March 20, he was recalled by Portland. On July 7, 2016, Alexander was waived by the Trail Blazers. The transaction was a maneuver to create salary cap space for Festus Ezeli. After he cleared waivers, the Trail Blazers added him to its NBA Summer League roster. On September 8, 2016, Alexander signed with the Orlando Magic, but was later waived on October 16 after appearing in two preseason games. On October 29, he was acquired by the Erie BayHawks of the NBA Development League as an affiliate player of the Magic. In 22 games he averaged 11.9 points, 8.0 rebounds and 1.1 blocks in 24.5 minutes. On January 31, 2017, Alexander was traded to the Long Island Nets in exchange for 2017 third round pick. On April 2, 2017, Alexander signed a 10-day contract with the Brooklyn Nets. He was waived two days later before appearing in a game for the Nets. The 10-day contract had been guaranteed and earned Alexander a year of service (toward payscale minimums and pension eligibility) in the NBA making him a 2-year veteran. On September 24, Alexander signed a one-year, non-guaranteed contract with the New Orleans Pelicans a few days before training camp began. Alexander was waived on October 14. On October 20, it was announced that the Wisconsin Herd had acquired returning player rights to Alexander in a trade with Long Island. On November 2, which was the eve of the season tipoff, Alexander was issued a 5-game suspension for violating league's Anti-Drug Program. On March 24, 2018, ASVEL Basket was reported to have signed with Alexander. Alexander was selected by USA Basketball to represent Team USA in the inaugural 2013 FIBA Americas 3x3 U18 Championship in August. He helped the team achieve gold. In the September 26–29, 2013 FIBA 3x3 U18 World Championship in Jakarta, Indonesia, Team USA finished 9th with a 7–1 record, losing in the opening round of 16 in the playoffs. Alexander's father is 6-foot-7-inch (2.01 m) Clifton Terry, who played basketball for Robeson High School and Kennedy–King College. Following his time at the two-year Kennedy-King, Terry declared for the 2001 NBA draft. His professional career included time in the NBA Development League. Alexander picked up basketball late due to the lack of available safe courts to play on in his Chicago West Side neighborhood known as the Brian Piccolo community. ^ a b Helfgot, Mike (May 3, 2011). 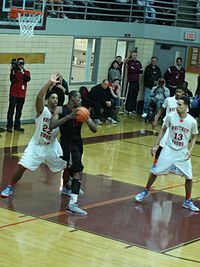 "Basketball recruiting notes - Curie's Cliff Alexander shows promise". Chicago Tribune. Retrieved October 4, 2013. ^ a b c Henricksen, Joe (May 13, 2011). "Hoops Report's Player Power Rankings: Part II". Chicago Sun-Times. Archived from the original on May 23, 2013. Retrieved October 3, 2013. ^ a b "Curie, Alexander building a reputation". Comcast SportsNet. November 28, 2011. Retrieved October 5, 2013. ^ Henricksen, Joe (December 22, 2010). "Holiday hoops primer: Part I". Chicago Sun-Times. Archived from the original on October 4, 2013. Retrieved October 3, 2013. ^ Hurst, Bob (March 9, 2011). "Boys basketball - 4A Argo Sectional: Nick Burt's layup seals Lyons' victory over Curie". Chicago Tribune. Retrieved October 5, 2013. ^ Henricksen, Joe (February 16, 2011). "Showdown week highlights season". Chicago Sun-Times. Archived from the original on May 23, 2013. Retrieved October 3, 2013. ^ Henricksen, Joe (May 30, 2011). "Hoops Report spring cleaning". Chicago Sun-Times. Archived from the original on May 23, 2013. Retrieved October 3, 2013. ^ Travis, Clyde (March 23, 2011). "Public League all- conference teams". Chicago Sun-Times. Retrieved October 5, 2013. ^ Henricksen, Joe (August 4, 2011). "Final look at summer of 2011". Chicago Sun-Times. Archived from the original on May 23, 2013. Retrieved October 3, 2013. ^ Henricksen, Joe (July 15, 2011). "Jabari, Jahlil, Big Cliff and everyone else". Chicago Sun-Times. Archived from the original on May 22, 2013. Retrieved October 3, 2013. ^ Henricksen, Joe (July 6, 2011). "Summer blockbusters". Chicago Sun-Times. Archived from the original on May 22, 2013. Retrieved October 3, 2013. ^ a b Henricksen, Joe (September 1, 2011). "Okafor, Alexander, White highlight 2014". Chicago Sun-Times. Archived from the original on May 22, 2013. Retrieved October 3, 2013. ^ O'Brien, Michael (December 30, 2011). "Parker, Simeon cruise past Curie for Pontiac title". Chicago Sun-Times. Retrieved October 4, 2013. ^ Liesse, Bill (December 30, 2011). "Boys basketball - Pontiac final: No. 1 Simeon, Nunn dominate No. 3 Curie". Chicago Tribune. Retrieved October 4, 2013. ^ Helfgot, Mike (January 22, 2012). "Boys Basketball - Curie's guards lead way past Young". Chicago Tribune. Retrieved July 2, 2012. ^ Phillips, Scott (January 22, 2012). "Boys Basketball: Curie wins showdown with Young". Chicago Sun-Times. Archived from the original on October 4, 2013. Retrieved October 4, 2013. ^ Helfgot, Mike (February 17, 2012). "Boys Basketball - Public League final: Taylor steps up with Parker foul trouble as No. 1 Simeon tops No. 3 Curie". Chicago Tribune. Retrieved February 18, 2012. ^ O'Brien, Michael (February 17, 2012). "Boys Basketball: Simeon staves off Curie, takes city title". Chicago Sun-Times. Archived from the original on February 19, 2012. Retrieved February 18, 2012. ^ Powers, Scott (February 17, 2012). "Simeon holds off Curie to win Public League title". ESPN. Retrieved February 18, 2012. ^ "High school basketball on ESPN". ESPN HS. March 1, 2012. Retrieved March 10, 2012. ^ "Boys basketball - Associated Press 4A, 3A All-State teams announced". Chicago Tribune. March 14, 2012. Retrieved October 4, 2013. ^ Hassenstab, Kellon (June 8, 2012). "Pangos All-American Camp Recap: The 10th annual all-star camp features the finest from the West Coast and beyond". SLAM Magazine. Archived from the original on October 12, 2013. Retrieved October 5, 2013. ^ "KU, Self take look at Class of 2014". KUSports.com. The World Company. July 29, 2012. Retrieved October 4, 2013. ^ a b Powers, Scott (July 17, 2012). "Kentucky offers Curie center Alexander". ESPN. Retrieved October 3, 2013. ^ Kline, Alex (July 24, 2012). "Two Lead For Cliff Alexander". Rivals.com. Retrieved October 4, 2013. ^ Henricksen, Joe (October 3, 2012). "Top Illinois trio in 2014 best since ..." Chicago Sun-Times. Archived from the original on May 23, 2013. Retrieved October 4, 2013. ^ Henricksen, Joe (November 24, 2012). "Will Class of 2014 push all-time great classes?". Chicago Sun-Times. Archived from the original on May 24, 2013. Retrieved October 4, 2013. ^ Beckett, Ann (December 4, 2012). "Oak Hill Academy powers through Curie and Southwind at 2012 Hoopfest". Marshall County Daily. Retrieved October 4, 2013. ^ Price, Jeremy (December 6, 2012). "IU basketball notes: Trending Now". The Hoosier Scoop. Hoosier Times Inc. Retrieved October 4, 2013. ^ Helfgot, Mike (December 29, 2012). "Pontiac tourney semifinal - Simeon's Pollard clutch again against Curie". Chicago Tribune. Retrieved October 4, 2013. ^ O'Brien, Michael (December 29, 2012). "Simeon downs Cliff Alexander-led Curie". High School Cube. Retrieved October 4, 2013. ^ Helfgot, Mike (February 11, 2013). "Morgan Park beats Curie in Public League quarterfinals: Mustangs earn shot at Simeon". Chicago Tribune. Retrieved October 4, 2013. ^ "AP ranks Washington, Manual boys basketball in top 10". Journal Star. February 26, 2013. Retrieved February 27, 2013. ^ Henricksen, Joe (February 25, 2013). "Tourney time storylines to follow". Chicago Sun-Times. Archived from the original on May 23, 2013. Retrieved February 27, 2013. ^ Helfgot, Mike (March 4, 2013). "Boys hoops blog - Alexander-Okafor matchup intriguing, as is Young-Curie". Chicago Tribune. Retrieved March 5, 2013. ^ Ryan, Shannon (March 2, 2013). "Steady Illinois withstands pesky Nebraska: Illini overcome hot-shooting Cornhuskers to post 72-65 victory". Chicago Tribune. Retrieved October 4, 2013. ^ Helfgot, Mike (March 7, 2013). "Boys hoops - Some coaches unhappy with rescheduling of sectional games". Chicago Tribune. Retrieved March 8, 2013. ^ Kane, Colleen (March 7, 2013). "Simeon All Access - Smith downplays schedule issues". Chicago Tribune. Retrieved March 8, 2013. ^ Helfgot, Mike (March 7, 2013). "Boys hoops - 4A sectional: Peak, Okafor help Young earn rematch with Simeon". Chicago Tribune. Retrieved March 8, 2013. ^ Powers, Scott (April 17, 2013). "Jahlil Okafor to hold in-home visits". ESPN. Retrieved April 18, 2013. ^ Payne, Terrence (April 27, 2013). "Report: Jahlil Okafor says its '99.9′ percent chance he and Tyus Jones play together in college". NBC Sports. Retrieved May 2, 2013. ^ Payne, Terrence (June 4, 2013). "Cliff Alexander: 'doesn't matter to me' where Jahlil Okafor and Tyus Jones go to college". NBC Sports. Retrieved June 21, 2013. ^ Travis, Clyde (February 12, 2013). "Simeon's Jabari Parker heads the 2013 Sun-Times All-Public League team". Chicago Sun-Times. Retrieved February 13, 2013. ^ "Stevenson's Brunson earns all-state basketball honors". Lake County News-Sun. March 15, 2013. Retrieved October 4, 2013. ^ Helfgot, Mike (March 30, 2013). "2013 Tribune All-State first team". Chicago Tribune. Retrieved October 4, 2013. ^ "2012-13 High School Hardwood All-Americans". HighSchoolHardwood.com. May 24, 2013. Archived from the original on October 12, 2013. Retrieved October 5, 2013. ^ a b c d Sam, Aggrey (September 24, 2013). "Welcome 2 Chicago: Already famed for its PGs and wings, gifted big men Cliff Alexander and Jahlil Okafor will keep the prep hoops spotlight firmly on the Windy City this season". SLAM Magazine. Retrieved October 5, 2013. ^ McGavin, Patrick Z. (June 15, 2013). "Davis, Pippen among those at Young H.S. for debut of new pro-am basketball league". Chicago Sun-Times. Retrieved October 4, 2013. ^ Harper, Krissy (June 19, 2013). "The Game Changer: Local legends showed out at Nike Chi League Pro-Am this weekend". SLAM Magazine. Archived from the original on October 12, 2013. Retrieved October 5, 2013. ^ Hazan, Danny (July 20, 2013). "Centers of Attention: Elite post players highlight the Under Armour Summer Jam". SLAM Magazine. Retrieved October 7, 2013. ^ Bossi, Eric (September 4, 2013). "Okafor Retains Hold on Top Spot in Rivals 150". Rivals.com. Retrieved September 4, 2013. ^ Powers, Scott (September 22, 2013). "Alexander cuts Kentucky, adds UConn, Oregon". ESPN. Retrieved October 3, 2013. ^ Payne, Terrence (October 7, 2013). "2014 Spalding Hoophall Classic schedule released: Headliners include Oak Hill Academy, Findlay Prep, and St. Anthony". MassLive.com. Retrieved October 29, 2013. ^ Parini, Jason S. (October 24, 2013). "ESPN Champions Classic in Chicago a Blow to Illinois Basketball?". Bleacher Report. Retrieved October 30, 2013. ^ Kuznia, Roger (November 14, 2013). "Wherever Cliff Alexander goes, his skills fit any program". Sporting News. Retrieved November 15, 2013. ^ Powers, Scott (October 25, 2013). "Alexander recruiting visit has Illini excited". ESPN. Retrieved October 30, 2013. ^ Fornelli, Tom (October 28, 2013). "Alexander Family 'Had A Great Time' On Official Visit". TheChampaignRoom.com. SB Nation. Retrieved October 30, 2013. ^ Leung, Diamond (October 31, 2013). "Top recruit Cliff Alexander eliminates Michigan State from consideration: 'Right now, no relationship'". MLive.com. Retrieved November 5, 2013. ^ Flores, Ron M. (November 7, 2013). "Mudiay Tops 2013-14 Preseason POY Tracker". StudentSports.com. Retrieved December 10, 2013. ^ Flores, Ron M. (November 9, 2013). "Mr. Basketball USA: All-Time Favorites". StudentSports.com. Retrieved December 10, 2013. ^ Keeney, Tim (November 14, 2013). "Prediction for Tyus Jones and Jahlil Okafor's Duke vs. Kansas Decision". Bleacher Report. Retrieved November 15, 2013. ^ Curi, Ryan (November 14, 2013). "Cliff Alexander: What Landing 5-Star Stud Would Mean for Fighting Illini". Bleacher Report. Retrieved November 15, 2013. ^ "No. 3 Cliff Alexander Commits to Kansas". ESPN. November 15, 2013. Retrieved November 15, 2013. ^ Stainbrook, Michael (November 15, 2013). "Curie's Cliff Alexander chooses Kansas over Illinois". Chicago Tribune. Retrieved November 15, 2013. ^ Borzello, Jeff (November 15, 2013). "Kansas beats out Illinois for No. 3 prospect Cliff Alexander". CBS Sports. Retrieved November 15, 2013. ^ "Photos - Curie's Alexander picks Kansas". Chicago Tribune. November 15, 2013. Retrieved November 16, 2013. ^ Halley, Jim; Jason Jordan (November 20, 2013). "2013 Preseason American Family Insurance ALL-USA Boys Basketball Team". USA Today. Retrieved November 20, 2013. ^ Helfgot, Mike (November 27, 2013). "Boys hoops - Top 5 Mr. Basketball candidates". Chicago Tribune. Retrieved December 13, 2013. ^ Helfgot, Mike (December 7, 2013). "Boys hoops - Alexander leads Curie past Las Vegas Bishop Gorman". Chicago Tribune. Retrieved December 10, 2013. ^ Dodd, Rustin (December 13, 2013). "Cliff Alexander update". Kansas.com. Archived from the original on December 30, 2013. Retrieved December 30, 2013. ^ "Players of the Week". StudentSports.com. December 18, 2013. Retrieved December 30, 2013. ^ Helfgot, Mike (December 28, 2013). "Boys hoops - Cliff Alexander, Josh Stamps help Curie hold off Simeon for Pontiac title". Chicago Tribune. Retrieved December 30, 2013. ^ Murphy, Erich (January 2, 2014). "Williamson Award goes to Curie's Alexander". Pontiac Daily Leader. Retrieved January 13, 2014. ^ a b Henricksen, Joe (December 30, 2013). "Holiday stock report". Chicago Sun-Times. Archived from the original on January 9, 2014. Retrieved January 9, 2014. ^ a b Helfgot, Mike (December 30, 2013). "Boys hoops blog - Cliff Alexander has to be seen to be believed". Chicago Tribune. Retrieved January 9, 2014. ^ "POY Tracker: Seniors Stand Strong". StudentSports.com. January 10, 2014. Retrieved January 12, 2014. ^ "Carlton Bragg vs Cliff Alexander - Top 15 players in the country go head to head at McCracken County". Lexington Herald-Leader. Kentucky.com. January 11, 2013. Retrieved January 13, 2014. ^ Jones, Steve (January 11, 2013). "With Calipari watching, Trey Lyles has 29 points, 15 rebounds in win over Carlton Bragg (24, 9)". The Courier-Journal. Archived from the original on January 13, 2014. Retrieved January 13, 2014. ^ King, Thomas (January 20, 2014). "Hoophall Classic 2014: Cliff Alexander, Kelly Oubre show what Kansas basketball will look like after Andrew Wiggins, Joel Embiid". MassLive.com. Retrieved January 21, 2014. ^ Helfgot, Mike (January 20, 2014). "Boys hoops - Curie, Young make statement against nationally ranked teams". Chicago Tribune. Retrieved January 27, 2014. ^ a b Flores, Ronnie (January 20, 2014). "No. 1 & No. 2 Go Down". StudentSports.com. Retrieved January 27, 2014. ^ Borzello, Jeff (January 24, 2014). "Is Cliff Alexander No. 1 in 2014 ? How do other elites fit in college?". CBS Sports. Retrieved January 25, 2014. ^ Hickman, Jason (January 21, 2014). "MaxPreps Top 25 national high school boys basketball rankings". MaxPreps. Retrieved January 27, 2014. ^ Flores, Ronnie (January 23, 2014). "Like Cliff: Memorable Individual Performances". StudentSports.com. Retrieved January 27, 2014. ^ Flores, Ronnie (January 21, 2014). "Updated FAB 50 National Rankings". StudentSports.com. Retrieved January 27, 2014. ^ "POY Tracker: Alexander A Slam Dunk". StudentSports.com. January 30, 2014. Retrieved January 31, 2014. ^ Helfgot, Mike (February 4, 2014). "Boys hoops blog - Will Cliff Alexander, Jahlil Okafor meet again in city final?". Chicago Tribune. Retrieved February 6, 2014. ^ "Illinois-How They Fared". San Francisco Chronicle. February 10, 2014. Retrieved February 12, 2014. ^ Helfgot, Mike (February 8, 2014). "Boys hoops - CPS playoffs: Cliff Alexander, Josh Stamps get job done for Curie". Chicago Tribune. Retrieved February 12, 2014. ^ Helfgot, Mike (February 16, 2014). "Boys hoops - No. 1 Curie survives Simeon, moves on to Public League semifinal". Chicago Tribune. Retrieved February 17, 2014. ^ O'Brien, Mike (February 16, 2014). "Curie gets clutch performance from Devin Gage in Public League quarterfinal win". High School Cube News. Chicago Sun-Times. Retrieved February 17, 2014. ^ Helfgot, Mike (February 19, 2014). "Boys hoops - Curie nips Hyde Park for Public League final berth". Chicago Tribune. Retrieved February 20, 2014. ^ Travis, Clyde (February 19, 2014). "Curie hangs on, advances to city title game". High School Cube News. Chicago Sun-Times. Retrieved February 20, 2014. ^ Henricksen, Joe (February 17, 2014). "Joe Henricksen's weekly three-pointer". Chicago Sun-Times. Retrieved February 20, 2014. ^ "POY Tracker: What It Takes". StudentSports.com. February 20, 2014. Retrieved February 23, 2014. ^ Helfgot, Mike (February 21, 2014). "Boys hoops - Public League final: Kamar Marshall's 3 gives Curie win in 4 OTs". Chicago Tribune. Retrieved February 22, 2014. ^ O'Brien, Michael (February 21, 2014). "Unlikely hero helps Curie make school history". High School Cube News. Chicago Sun-Times. Retrieved February 22, 2014. ^ "Curie tops Whitney Young in four overtimes for city title". Comcast SportsNet. February 21, 2014. Archived from the original on February 22, 2014. Retrieved February 22, 2014. ^ a b Johnson, Chris (February 26, 2014). "Jahlil Okafor, Cliff Alexander give Duke, Kansas fans early excitement for next year". Sports Illustrated. Archived from the original on February 27, 2014. Retrieved February 27, 2014. ^ Greenberg, Jon (February 26, 2014). "Future bright for Chicago prep stars: Cliff Alexander earns bragging rights over Jahlil Okafor in thrilling championship". ESPN. Retrieved February 27, 2014. ^ a b O'Donnell, Ricky (February 22, 2014). "Jahlil Okafor vs. Cliff Alexander and an instant classic Chicago high school championship game". SB Nation. Retrieved February 27, 2014. ^ a b "No. 2 Chicago Curie forfeits season". Associated Press. March 1, 2014. Retrieved March 1, 2014. ^ Mike Helfgot; Noreen Ahmed-Ullah (February 28, 2014). "Curie stripped of Public League basketball title, forfeits all wins". Chicago Tribune. Retrieved March 1, 2014. ^ a b O'Brien, Michael (February 28, 2014). "Curie forfeits all wins including CPS title". Chicago Sun-Times. Retrieved March 1, 2014. ^ O'Brien, Michael (February 19, 2014). "Young rallies past Orr, sets up 'matchup for the ages' with Curie". High School Cube News. Chicago Sun-Times. Retrieved February 20, 2014. ^ Helfgot, Mike (February 20, 2014). "Boys hoops blog - Alexander, Okafor to collide with city title on line". Chicago Tribune. Retrieved February 21, 2014. ^ Greenberg, Jon (March 5, 2014). "Cliff Alexander, Curie stunned by loss: After being deemed eligible for state tournament, Condors fall in overtime". ESPN. Retrieved March 17, 2014. ^ Helfgot, Mike (March 4, 2014). "Boys hoops - DuSable stuns No. 1 Curie in 4A regional semis". Chicago Tribune. Retrieved March 5, 2014. ^ O'Brien, Michael (March 4, 2014). "Curie eliminated from state playoffs; Cliff Alexander had 25 points". Chicago Sun-Times. Retrieved March 5, 2014. ^ "Official Basketball Box Score -- Game Totals -- Final Statistics" (PDF). McDonald's All-American. April 2, 2014. Retrieved April 3, 2014. ^ Dodd, Rustin (April 18, 2014). "KU signee Cliff Alexander chosen MVP at Jordan Brand Classic". The Wichita Eagle. Kansas.com. Archived from the original on April 19, 2014. Retrieved April 19, 2014. ^ Phillips, Scott (April 18, 2014). "Chicago duo Jahlil Okafor, Cliff Alexander earn MVP honors as East beats West in Jordan Brand Classic". NBC Sports. Retrieved April 19, 2014. ^ "Jahlil Okafor, Cliff Alexander Win Co-MVPs at 2014 Jordan Classic". SLAM Magazine. April 18, 2014. Retrieved April 19, 2014. ^ Meagher, Sean (January 20, 2014). "Jahlil Okafor headlines USA roster for 2014 Nike Hoop Summit". OregonLive.com. Retrieved January 20, 2014. ^ "Okafor, Alexander named to Men's Jr. National Team". Comcast SportsNet. January 20, 2014. Archived from the original on January 22, 2014. Retrieved January 20, 2014. ^ Borzello, Jeff (January 29, 2013). "Players announced for McDonald's All-American Game". CBS Sports. Retrieved January 29, 2013. ^ "Final Rosters Unveiled For The 2014 McDonald's All American Games: 48 Players Join the Ranks of Basketball's Elite with Selection to 2014 Team". PR Newswire. January 29, 2013. Retrieved January 29, 2013. ^ Travis, Clyde (February 13, 2014). "Jahlil Okafor, Cliff Alexander lead All-City Team". Chicago Sun-Times. Archived from the original on February 23, 2014. Retrieved February 17, 2014. ^ "Naismith Trophy High School Player of the Year Finalists". NaismithAwards.com. February 18, 2014. Archived from the original on February 25, 2014. Retrieved February 20, 2014. ^ Hawk, Dan (March 7, 2014). "Kansas Men's Basketball Signee Cliff Alexander Named Naismith Boys High School Player of the Year". KOAM-TV. Retrieved March 8, 2014. ^ a b O'Brien, Michael (March 7, 2014). "Sun-Times Player of the Year: Cliff Alexander". Chicago Sun-Times. Archived from the original on March 8, 2014. Retrieved March 8, 2014. ^ "Jordan Brand Classic roster revealed". ESPN. March 10, 2014. Retrieved March 10, 2014. ^ McLaughlin, Brian (March 14, 2014). "Meet Parade's 2014 All-America Basketball Teams". Parade. Retrieved March 15, 2014. ^ "Boys hoops - AP announces 3A, 4A all-state teams". Chicago Tribune. March 22, 2014. Retrieved March 23, 2014. ^ "2014 Mr. Basketball of Illinois voting". Chicago Tribune. March 29, 2014. Retrieved April 2, 2014. ^ Halley, Jim (April 8, 2014). "2014 American Family Insurance ALL-USA Boys Basketball Team". USA Today. Retrieved April 11, 2014. ^ Hickman, Jason (April 19, 2014). "MaxPreps 2013-14 Boys Basketball All-American Team". MaxPreps. Retrieved April 20, 2014. ^ Flores, Ronnie (April 16, 2014). "Cliff Alexander Named Mr. Basketball USA". StudentSports.com. Archived from the original on April 20, 2014. Retrieved April 20, 2014. ^ "Final 2013-14 POY Tracker". StudentSports.com. April 15, 2014. Archived from the original on April 20, 2014. Retrieved April 20, 2014. ^ Henricksen, Joe (September 26, 2011). "Mac Irvin Jam provides sneak peek". Chicago Sun-Times. Archived from the original on May 22, 2013. Retrieved October 4, 2013. ^ DeCourcy, Mike (July 12, 2013). "'War' rages to land Cliff Alexander, powerful 2014 recruit". Sporting News. Retrieved October 4, 2013. ^ "11 - Cliff Alexander". NBADraft.net. Retrieved October 7, 2013. ^ Miller, Kerry (April 17, 2014). "Strengths and Weaknesses for Every Player in the 2014 Jordan Brand Classic". Bleacher Report. Retrieved April 20, 2014. ^ Calle, Franklyn (June 20, 2012). "2012 NBPA Top 100 Camp Recap: Kuran Iverson, AI's younger cousin, was among the top performers last weekend". SLAM Magazine. Archived from the original on October 12, 2013. Retrieved October 5, 2013. ^ Helfgot, Mike (January 11, 2014). "Tribune/WGN Ch. 9 Athlete of the Month - Curie's Cliff Alexander". Chicago Tribune. Retrieved January 28, 2014. ^ "Staten Leads Preseason Men's Basketball Honors". Big12Sports.com. October 2, 2014. Retrieved October 23, 2014. ^ "College Hoops Rankings: 39-20". ESPN. November 3, 2014. Retrieved November 3, 2014. ^ "USA TODAY Sports' 2014-15 preseason college basketball All-American team". USA Today. November 12, 2014. Retrieved November 13, 2014. ^ Dauster, Rob (November 3, 2014). "College Basketball Talk's 2014-2015 Preseason All-American Teams". NBC Sports. Retrieved November 5, 2014. ^ "Wooden Top 50 watch list unveiled". ESPN. November 17, 2014. Retrieved November 18, 2014. ^ "Five Named To USBWA Watch List". Big12Sports.com. November 24, 2014. Retrieved November 25, 2014. ^ "Naismith Watch List of 50 announced". NCAA. December 3, 2014. Retrieved December 9, 2014. ^ "UC Santa Barbara 59 (0-1, 0-1 away); (5) Kansas 69 (1-0, 1-0 home)". ESPN. November 14, 2014. Retrieved November 15, 2014. ^ "Greene, Ellis lead Kansas to 87-60 win over Rider". ESPN. Associated Press. November 24, 2014. Retrieved December 1, 2014. ^ "No. 11 Kansas survives Tennessee, makes Orlando Classic final". ESPN. Associated Press. November 28, 2014. Retrieved December 1, 2014. ^ "Perry Ellis scores 17 as Kansas gets past Michigan State". ESPN. Associated Press. November 30, 2014. Retrieved December 1, 2014. ^ "Florida 65 (3-4, 0-1 away); (11) Kansas 71 (6-1, 3-0 home)". ESPN. December 5, 2014. Retrieved December 6, 2014. ^ Payne, Terrence (December 6, 2014). "Late Night Snacks: Top-ranked Kentucky tops No. 6 Texas, No. 11 Kansas erases large halftime deficit". NBC Sports. Retrieved December 6, 2014. ^ "Selden, Jayhawks Rally to Top Florida, 71-65". KUAthletics.com. December 5, 2014. Retrieved January 20, 2015. ^ Dodd, Rustin (December 19, 2014). "KU's Cliff Alexander to make first career start Saturday". The Kansas City Star. Retrieved February 11, 2015. ^ "Lafayette 69 (7-3, 3-3 away); (10) Kansas 96 (9-1, 4-0 home)". ESPN. December 20, 2014. Retrieved February 11, 2015. ^ "Kansas 96 (9-1) vs Lafayette 69 (7-3)". KUAthletics.com. December 20, 2014. Retrieved February 11, 2015. ^ "(10) Kansas 52 (9-2, 1-1 away); Temple 77 (8-4, 6-0 home)". ESPN. December 22, 2014. Retrieved February 11, 2015. ^ "No. 11 Kansas blows big first-half lead, holds off No. 19 Sooners". ESPN. Associated Press. January 19, 2015. Retrieved January 20, 2015. ^ "Fighting Fire with Fire, Kansas Puts Away Oklahoma, 85-78". KUAthletics.com. January 19, 2015. Retrieved January 20, 2015. ^ "Cliff Alexander named Big 12 Newcomer of Week". Lawrence Journal-World. January 26, 2015. Retrieved January 26, 2015. ^ "Trio Chosen For Men's Basketball Weekly Awards". Big12Sports.com. January 26, 2015. Retrieved January 27, 2015. ^ "(8) Kansas 73 (20-4, 9-2 Big 12); Texas Tech 51 (12-13, 2-10 Big 12)". ESPN. February 10, 2015. Retrieved February 11, 2015. ^ "3s freed as No. 8 KU tops Texas Tech, 73-51: Jayhawks make first six treys in second half". The Topeka Capital-Journal. February 11, 2015. Retrieved February 10, 2015. ^ "Kansas F Cliff Alexander to miss game vs. Texas due to NCAA issue". Sports Illustrated. February 28, 2013. Retrieved March 4, 2015. ^ Rodgers, Joe (March 16, 2015). "Jayhawks' Cliff Alexander to miss NCAA Tournament". Sporting News. Retrieved March 31, 2015. ^ Feldman, Dan (April 7, 2015). "Kansas Freshman Cliff Alexander Forced Into NBA Draft". NBC Sports. Retrieved April 13, 2015. ^ "Cliff Alexander headed to NBA". ESPN. April 7, 2015. Retrieved April 13, 2015. ^ Parrish, Gary (April 7, 2015). "Cliff Alexander leaving Kansas". CBS Sports. Retrieved April 13, 2015. ^ Pincus, Eric (June 2, 2015). "Kansas' Cliff Alexander suffers knee injury in Lakers' draft workout". Los Angeles Times. Retrieved October 29, 2015. ^ Lorenzo, Tom (June 29, 2015). "Brooklyn Nets announce 19-man Summer League roster". SB Nation. Retrieved October 29, 2015. ^ a b "Trailblazers' Cliff Alexander: Knee injury persists". CBS Sports. October 27, 2015. Retrieved October 29, 2015. ^ "Trail Blazers Sign Phil Pressey and Cliff Alexander". NBA.com. July 24, 2015. Retrieved July 24, 2015. ^ "How will Cliff Alexander's knee injury affect his status in Portland?". FOX Sports. October 5, 2015. Retrieved October 29, 2015. ^ "Drummond leads Pistons to comeback 120-103 win over Blazers". ESPN. Associated Press. November 8, 2015. Retrieved November 11, 2015. ^ Richman, Mike (November 8, 2015). "Trail Blazers' Cliff Alexander says he will 'suit up' against Detroit Pistons". The Oregonian/OregonLive.com. Retrieved November 11, 2015. ^ Gundersen, Erik (November 8, 2015). "Blazers forward Cliff Alexander on active roster for first time vs. Detroit". The Columbian. Retrieved November 11, 2015. ^ "Trail Blazers 94 (4-7, 2-4 away); Hornets 106 (5-5, 3-1 home)". ESPN. November 15, 2015. Retrieved November 16, 2015. ^ "Trail Blazers Assign Cliff Alexander and Luis Montero to Santa Cruz Warriors". OurSportsCentral.com. March 10, 2016. Retrieved March 10, 2016. ^ Richman, Mike (March 20, 2016). "Trail Blazers recall Luis Montero, Cliff Alexander from NBA Development League". OregonLive.com. Retrieved March 24, 2016. ^ "TRAIL BLAZERS WAIVE CLIFF ALEXANDER". NBA.com. July 7, 2016. Retrieved July 7, 2016. ^ "Cliff Alexander: Waived by Trail Blazers on Thursday". CBS Sports. July 8, 2016. Retrieved July 11, 2016. ^ "Cliff Alexander: To play with Trail Blazers Summer League team". CBS Sports. July 9, 2016. Retrieved July 11, 2016. ^ "Orlando Magic Sign Six Players". NBA.com. September 8, 2016. Retrieved September 8, 2016. ^ "Magic Waive Alexander, Dawson, Murphy". NBA.com. October 16, 2016. Retrieved October 16, 2016. ^ "Nine Players Added to 2016 Training Camp Roster". NBA.com. October 29, 2016. Retrieved October 30, 2016. ^ a b "Long Island Nets Acquire Cliff Alexander". NBA.com. January 31, 2017. Retrieved February 1, 2017. ^ "Nets Creatively Honored Agreements With Cliff Alexander, Prince Ibeh". RealGM.com. April 4, 2017. Retrieved April 5, 2017. ^ "NBA Transactions". NBA.com. Retrieved April 5, 2017. ^ Scotto, Michael (September 24, 2017). "New Orleans Pelicans and Cliff Alexander Agree To Deal". Basketballinsiders.com. Retrieved September 26, 2017. ^ "The Pelicans land Cliff Alexander". USbasket.com. September 24, 2017. Retrieved September 26, 2017. ^ Guillory, William (October 14, 2017). "Pelicans waive Perry Jones, Cliff Alexander: source". NOLA.com. Retrieved October 16, 2017. ^ msteinberg (October 20, 2017). "Herd Acquire Returning Player Rights to Cliff Alexander". Wisconsin Herd. Retrieved October 21, 2017. ^ "NBA G League Tips Off 2017-18 Season On Nov. 3". NBA.com. October 30, 2017. Retrieved November 7, 2017. ^ "Wisconsin Herd's Cliff Alexander Suspended". NBA.com. November 2, 2017. Retrieved November 7, 2017. ^ "ASVEL signing Cliff Alexander". sportando.basketball. March 24, 2018. Retrieved March 24, 2018. ^ "USA Basketball Teams Capture Men's, Women's 2013 FIBA Americas 3x3 U18 Championship Gold Medals". USA Basketball. September 1, 2013. Archived from the original on October 4, 2013. Retrieved October 3, 2013. ^ "USA Women Claim FIBA 3x3 U18 World Championship Gold". USA Basketball. September 29, 2013. Archived from the original on October 4, 2013. Retrieved October 3, 2013. ^ "USA Men's 3x3 U18 World Championship Team -- All-Time Results & Standings". USA Basketball. Archived from the original on October 4, 2013. Retrieved October 3, 2013. Wikimedia Commons has media related to Cliff Alexander.